San Diego is a mecca for aquatic wildlife and oceanic ecosystems; it’s one reason you must visit the Birch Aquarium in La Jolla. 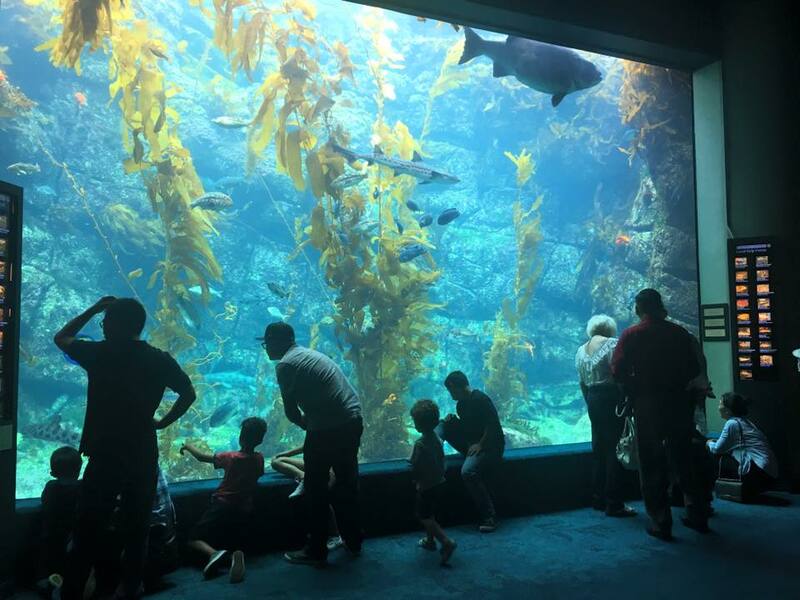 This La Jolla aquarium has much to offer kids and adults, making it one of the top things to do in La Jolla for families. Situated on a hilltop overlooking the Pacific Ocean, the Birch Aquarium is home to more than 3,000 fish and 60 habitats, providing a unique opportunity to become immersed in an underwater world of sharks, seahorses, living coral reefs and more! Contained within the Scripps Institution of Oceanography at UC San Diego, the aquarium offers an immersive experience of the ocean sciences, conservation and research. 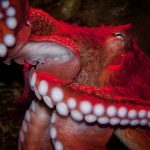 Here’s a planned itinerary for a day at the Birch Aquarium, so you can focus on enjoying the day – not worrying about the details of planning. To make planning a trip to Birch Aquarium easy, we recommend buying aquarium tickets in advance online. It saves you time and even money vs. buying them upon arrival. Head to this page on the Birch Aquarium website for special deals and discounts. Before you go, make sure to check the calendar of events at Birch Aquarium. Each day, there are things to do at different times such as the Kelp Tank Dive Show. Check out the daily schedule for an updated list of everything happening each week. Eat before your trip to Birch Aquarium, so you and your posse can focus on the great exhibits – rather than stopping too often to snack. We recommend local spots that open early, good no matter what time you & your family are hungry, and serve great food. 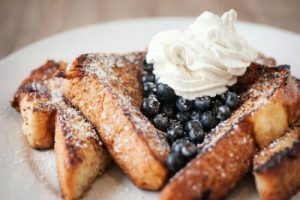 Caroline’s Seaside Cafe – This La Jolla cafe overlooks the Pacific Ocean, providing a great view and a variety of breakfast options including, but not limited to: pancakes, eggs (such as vegetable and Mediterranean egg scramble), greek yogurt parfaits and more. The Daily Bagel – A local San Diego bagel shop known for great fare and a welcoming family atmosphere. Bella Vista Social Club & Caffe – This oceanside cafe in La Jolla has a breathtaking view and a large parking lot. Nestled near the world famous Salk Institute, it has both indoor and outdoor seating. Breakfast includes options like decadent bagels, omelettes served with rosemary potatoes, acai bowls, black truffle quiche and more. Directions: You can drive yourself to the aquarium or – if you are visiting without an automobile or don’t want to worry about finding parking – here are options for public transport to Birch Aquarium. Parking: Free parking is available for three hours in the designated aquarium lot. After three hours, parking is $8 per every 24 hours. Handicapped parking is located in the traffic circle at the front of the aquarium. 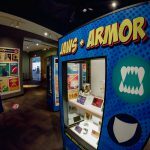 Whether you’re exploring one of the interactive exhibits, checking out the tide pools or participating in one of the numerous aquarium events, there are many things to do at Birch Aquarium. 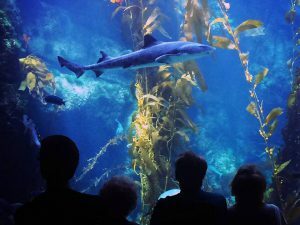 Here are some of the top attractions at this La Jolla aquarium. Elasmo Beach: Discover sharks and rays that are native to La Jolla’s waters in a 13,000-gallon tank. Living Tide Pools:Take the opportunity to get close-up views of sea stars, hermit crabs, sea cucumbers, lobsters and more. Virtual Experience of Mexican Seas: A virtual and visual photographic experience of four biodiversity hot spots found in Mexican waters. There’s Something about Seahorses: An up-close encounter with more than a dozen seahorse species. Boundless Energy: Experience first-hand how we can use renewable energy from wind, sun and sea. Giant Kelp Tank: Arguably one of the most popular attractions at the Aquarium, this 70,000 gallon, two-story tank is an awesome display of an underwater forest ecosystem. You’ll see tons of leopard sharks, Moray eels, an endangered Giant Black Sea Bass, and more. Be sure to check out one of the Kelp Tank Dive Shows, too; divers actually feed the tank creatures and will answer any questions. Animal Feedings:Ever wondered what it would be like to dine with fish, sharks and lobsters? Consider this your official invitation to dinner! Each day, aquarists feed the different animals within their live displays, giving you a front row seat to the action. For a schedule of feedings, visit this handy itinerary. Infinity Cube **NEW**: The Infinity Cube is now open! It’s a huge, immersive installation that explores bioluminescence in the marine environment. 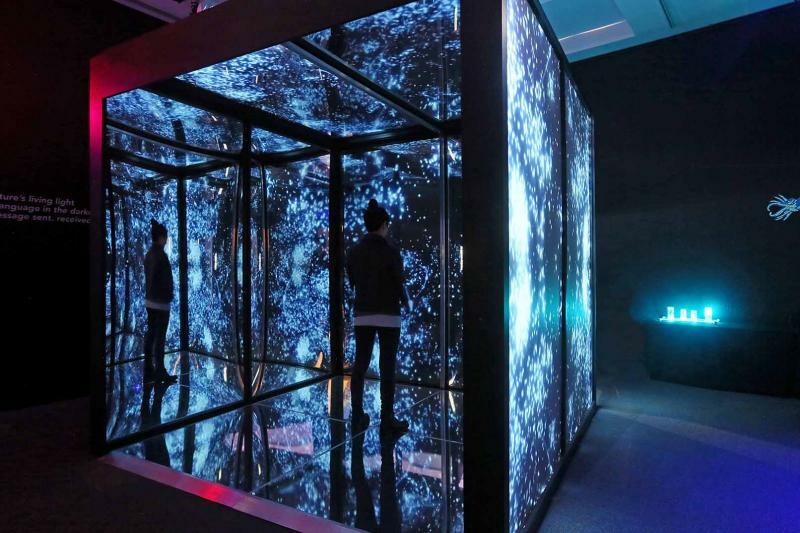 It surrounds guests in projected and reflected larger-than-life images of bioluminescence accompanied by soundscape. Definitely worth a stop! Pack a Picnic Lunch – After your day at Birch Aquarium or, as a break, bring a picnic lunch. Pack a cooler beforehand so whenever you and your family are hungry, it’s right at hand. 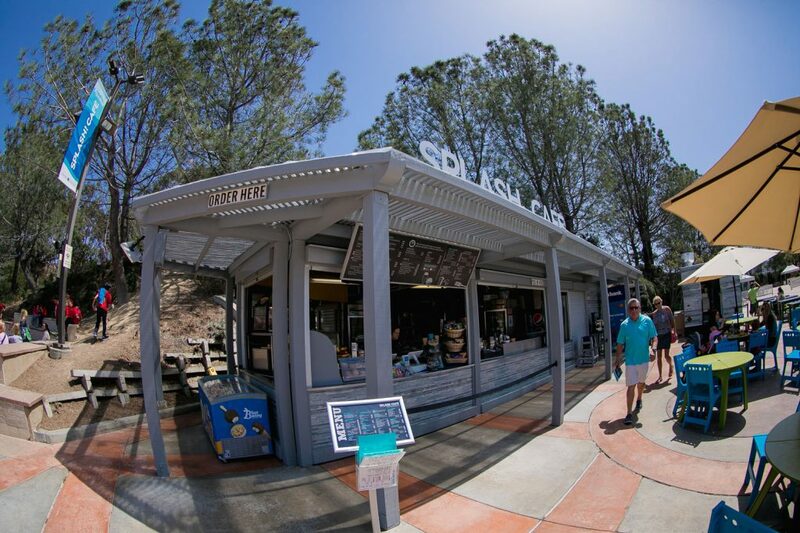 Enjoy Lunch at Birch Aquarium’s Splash! Cafe – This La Jolla aquarium has a gourmet cafe with food by The French Gourmet, where you’ll enjoy sandwiches, salads and side dishes here. Birch Aquarium is nestled above La Jolla Shores, providing an incredible view year-round. Make sure to head outside near the tide pool area to get picture of you and the family in front of the Pacific. After learning about the ocean and the ecosystems it holds, why not go explore it for yourself? It’s easy. Simply hop down to the beach below. 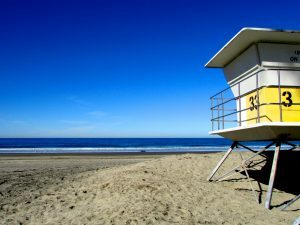 We recommend heading down to La Jolla Shores Beach – only 4 minutes away by car or 10 – 15 minutes using public transport to La Jolla Shores. 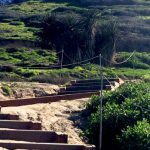 This beach has equipment rentals, playgrounds and bathrooms – making it perfect for a kids day in La Jolla. It’s also great for a sunset walk on the beach. The Shores Restaurant : Nestled on the 1st floor of the La Jolla Shores Hotel, this restaurant is a hidden gem in La Jolla. After a busy day of touring Birch Aquarium and visiting the beach, this elegant, beachside restaurant is the perfect spot to relax and enjoy a glass of wine. Make reservations at The Shores Restaurant here. (If you can make in time for happy hour, you should. Learn about the amazing Shores Restaurant happy hour here.